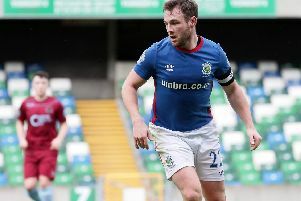 Former Ballymena United, Linfield and Glenavon winger Stuart King has taken interim charge of Banbridge Town. King was player/coach at Crystal Park after joining in January and recently took up the role as assistant manager. However, boss Ryan Watson has this week stood down from his position with immediate effect for personal and work reasons. “We wish to thank Ryan for all his hard work in the role of manager of Banbridge Town,” said club chairman Dominic Downey. “The window will be open for Ryan to return to the club should his circumstances change. “We will continue to support Ryan in any way we can. The role is King’s first position as manager, having previously been a coach at Ballyclare Comrades. Niall Lavery and Stephen Acheson have already joined the club this summer with King on the look-out for more recruits.